The Grand National, held at the Aintree Racecourse in Liverpool, is often called the greatest steeplechase in the world. It is also the most popular race in the United Kingdom in terms of betting and is routinely watched by even non-racing fans. 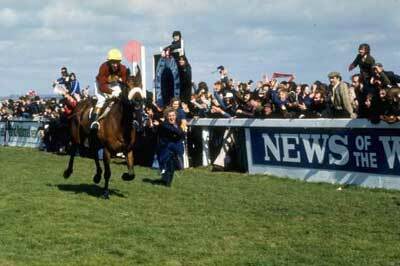 Certainly, the Grand National is one of the most famous thoroughbred races anywhere. The race involves four miles and four furlongs and 30 so-called drop fences � 16 individual fences, 14 of which are jumped twice. Most of the fences have a landing side that is lower than the take-off side, a fact that the horses are unaware of until they are up in the air. Some fences also have a landing side which is lower than the take-off side, which makes the racecourse more challenging for horses. In addition, there are also three unique fences along the course that are harder to negotiate -- one fence with a water obstacle, another fence with a 90 degree turn mid-way through the race and another fence which requires a longer run than the rest near the finish line. These difficult obstacles are one reason why the Grand National is more entertaining than the standard flat race. It also has a much bigger field than flat races, with the biggest field consisting of 66 runners (1929) while the smallest field was 10 runners (1983). Unfortunately, the torturous race track and big field, while exciting, also produce a relatively high incidence of injury and even death among participating horses. For this reason, the Grand National is a favorite target for protests by animal rights groups, despite the fact that the race has the highest levels of veterinary care on record. These protests have made organizers re-evaluate some of the obstacles and make them less difficult. Given its popularity, the Grand National is broadcast live on British terrestrial television, one of only 10 such events aired on UK TV. Starting in 2000, over 600 million people have watched the event on television around the world. This audience represents a significant jump since 1987 when the event was viewed by around 500 million people. Through the years, the Grand National's substantial audience has been treated to grand history on the race track. For instance, they witnessed the dominance of Red Rum, the Grand National's only three time winner (1973, 1974, 1977) and a runner-up two other times (1975, 1976). They saw Mr. Frisk blaze through the course in a record time of eight minutes, 47.8 seconds in 1990. They also saw four horses buck 100/1 odds to capture the race of their lives, including Foinavon (1967), Caughoo (1947), Gregalach (1929), and Tipperary Tim (1928). People marveled at the 1984 Grand National when 23 horses made it to the finish line, and they were aghast in 1928 when only two horses made their way to the end. The Grand National has had its share of fiction as well via the film National Velvet, which told the story of a young girl, played by Elizabeth Taylor, who trained an eventual Grand National winner. In addition, there was also the film "Champions," based on the 1981 Grand National won by Aldaniti and jockey Bob Champion.